358 pages | 31 B/W Illus. Kwame Dixon is an Associate Professor of Political Science at Howard University, who did his undergraduate work at the University of South Florida and received his Ph.D. from Clark-Atlanta University. He was awarded two Fulbright grants and has done extensive field research and lived in several Latin American countries, including Ecuador, Colombia and Brazil. 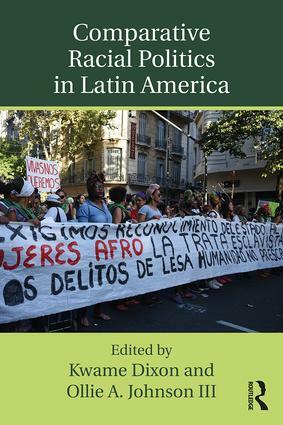 He is the author of Afro-Politics and Civil Society in Salvador da Bahia (University Press of Florida, 2016) and coeditor of Comparative Perspectives on Afro Latin America (University Press of Florida, 2012). He teaches courses on International Human Rights, Latin American Politics and Comparative Racial Politics. Ollie A. Johnson III is Chair and Associate Professor in the Department of African American Studies at Wayne State University. He is the coeditor of Race, Politics, and Education in Brazil: Affirmative Action in Higher Education (2015). He also authored Brazilian Party Politics and the Coup of 1964 and coedited Black Political Organizations in the Post-Civil Rights Era. Professor Johnson received his Ph.D. in Political Science from the University of California at Berkeley. His current research focuses on African American, Afro-Brazilian and Afro-Latin American Politics.